In 1997, the Canadian War Museum, then housed in an old building on Sussex Drive, was bursting at the seams. The federal government was willing to help fund a new building, but the Museum had to raise $15 million from the private sector. General Paul Manson was newly retired (“For a second time,” he says, smiling, referring to his earlier service as a fighter pilot with the Royal Canadian Air Force, and his more recent adieu to the aerospace industry). The timing was perfect. Appointed volunteer Chair of the Passing the Torch campaign, he describes the next seven years as “the happiest of my life.” General Manson and his dedicated team hit the goal and then some, netting $16.5 million from the private sector, and setting the record for the most successful fundraising effort of any federal cultural institution. 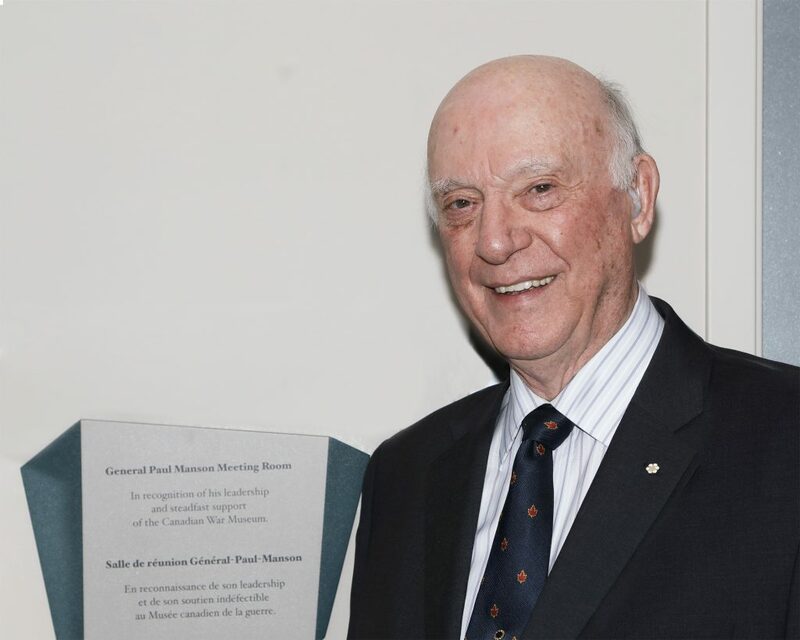 The late Barney Danson described General Manson as “no ordinary volunteer.” In December 2017, the Museum proudly dedicated the General Paul Manson Meeting Room to the extraordinary volunteer, donor, and valued friend of the Museum.